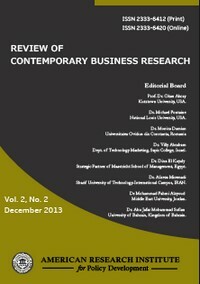 Review of Contemporary Business Research seeks to become a forum that stimulates the engagement between academics and practitioners interested in research in the area of contemporary business practices. This journal also features non-research materials, such as literature reviews and interviews with key figures. It disseminates current and relevant findings from worldwide business research. All research articles in this journal are rigorously peer reviewed, based on initial editor screening and anonymized reviewing by at least two referees. Each paper published in Review of Contemporary Business Research is assigned a DOI®number, which appears beneath the author's affiliation in the published paper. Click HERE to know what is DOI (Digital Object Identifier)? Click HERE to retrieve Digital Object Identifiers (DOIs) for journal articles, books, and chapters.